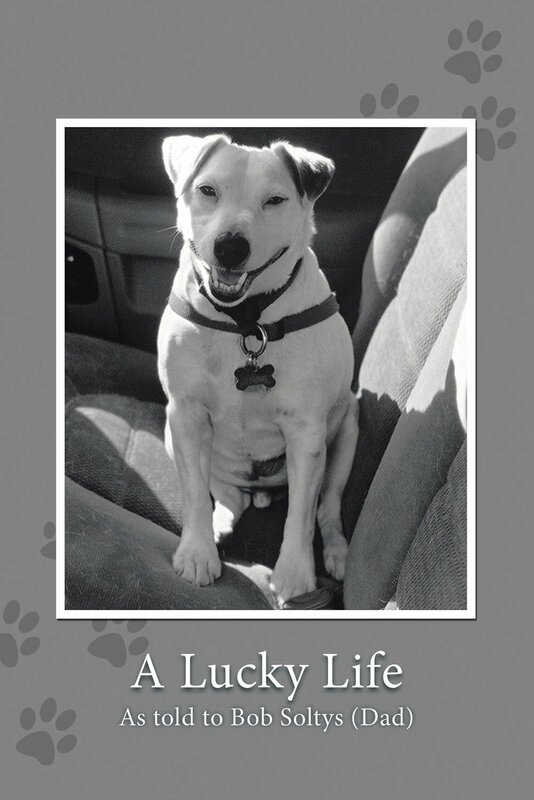 The book cover of "A Lucky Life" features the dog himself, Lucky. 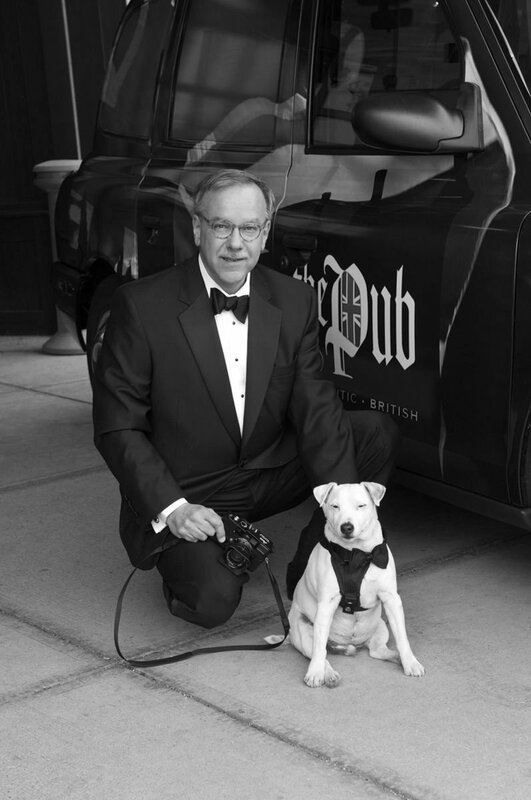 Bob Soltys and Lucky, looking dapper in their tuxes. Dogs writing books is nothing new. Remember Millie, former first lady Barbara Bush's dog, allegedly penning a bestseller more than 20 years ago? Now a dog writing a book that includes a few restaurant reviews and a description of a near-death experience, that's a different story, and it's the story of Lucky, with a little help from his "dad," Bob Soltys. Soltys lived in Northwest Indiana for a time and did some photo work for the Glen Park Herald in the 1970s. He was living and working in the Los Angeles area when he and Lucky, a Jack Russell terrier, met. Lucky's previous owner left the dog tied to a pole in front of an animal shelter. The shelter kept him for three days — the maximum for unclaimed animals — and was about to euthanize him when someone, who had been looking for another Jack Russell, took him instead. Another near-death experience still awaited him, but this first one was enough to earn him his name. A short time later Lucky and Soltys met, and it was love at first sight. Lucky began traveling — and dining — almost everywhere with Soltys. The book describes their many travels over the next dozen years, including a stop at Giovanni's in Munster. The one-paragraph description of Giovanni's seems to give the eatery a "paws up" endorsement from both Lucky and Soltys. It was Lucky's second close encounter with death that eventually led Soltys to write Lucky's memoirs. The pair were traveling to California from Ohio so Soltys could attend a photography workshop. Along the way they stopped at some old haunts, including restaurants, and to see old friends. Soltys stopped in a town in Colorado to get a cup of coffee, but, when Lucky got out to follow him, the dog collapsed. "He stepped off the curb, screamed and collapsed," Soltys said. "It was just awful. I thought he died. It was a busy street, and I couldn't tell if he was breathing. I was sitting on the curb with the dog in my arms and I was crying. I told him I was sorry it ended like this. Then he started moving again, and he had just passed out." Lucky's vet told Soltys shortly before the trip that Lucky had a heart problem, but Lucky should be fine on the trip. Lucky's collapse happened between Denver and Durango. So Soltys drove to Durango and found a vet, who said the altitude had exacerbated Lucky's condition. Soltys canceled the rest of the trip and the two returned home, where Lucky was diagnosed with pulmonary hypertension. Lucky has been on medications for the condition since that May 2015 incident. In November, Soltys decided it was time for Lucky to write a book about his experiences. "I wrote a book about the agency I had just retired from. It was not a happy book, and people want to read something happy. Even better, people like to read a dog's story. It was like he was talking to me. I tried to think what would a dog say if you put a pen in his hand and he was talking." Soltys did a kickstarter to fund the project and self-published "A Lucky Life" through Lulu.com in September, just in time for Lucky's 15th birthday. (He was found abandoned on Sept. 30 and that became his birthday.) Copies of the book are available through Aluckylifebook.com. Being self-published, Soltys said he has to do all the publicity and arrange the book-signings himself, and it's difficult to travel these days because of Lucky's health. The book, which is 63 pages long, of 441 in dog pages, gives Lucky's impressions of the food at places like Al's Roast Beef and other places in Chicago as well as in Cleveland and across the country, including bison burgers in Colorado. It also includes a stop at the lunch counter at the Wall Drug in Wall, S.D. Another mention goes to Granny Jo's Creamatorium, which Soltys said is located in what used to be a funeral parlor west of Cleveland. Lucky also provides readers with advice on the dangers of feeding pets table scraps. "Lucky ended up in the hospital from too much people food," Soltys said. "The vet really yelled at me. He got bladder stones." No cheese or french fries (every fry takes 10 minutes off a dog's life) and, of course, chocolate. Even a lucky dog's life isn't always an easy one. Orthopedic issues can cause severe pain in pets, but veterinarians say there are ways to prevent or minimize these agonizing conditions or injuries.